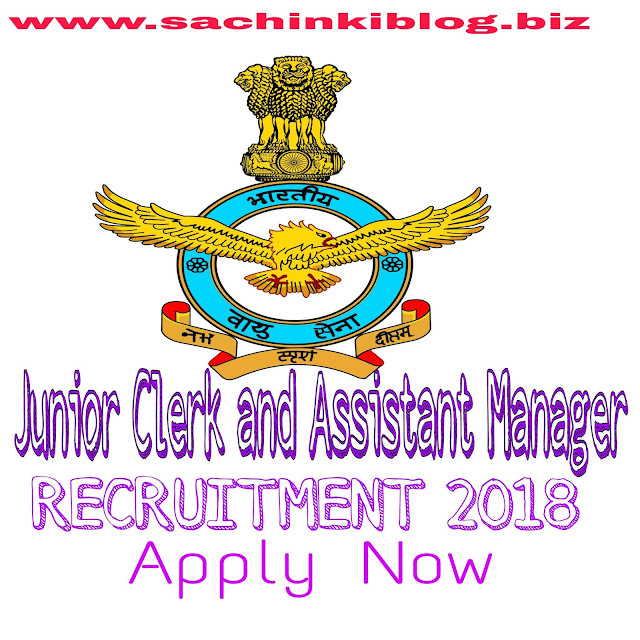 Indian air force has released a New notification for Junior Clerk and Assistant Manager posts all intrested candidates can apply for this post . We always try our level best to give you information best as best we can so plz subscribe us for our latest updates like our Facebook page also for daily important updates and job notifications 2018-19 Sachinkiblog is providing all details about recruitment. Please read all details to know about rally / recruitment which are given below. Air force recruitment notification by sachinkiblog 2018-19. Graduated in commerce from a Recognized Board or University with 60% Marks. 2. M.com or PGDBM from a Recognized institute/University etc. 3. Experience :- Accounting Experience at least of 10 Years. 2.M.Com or PGDBM from a recognized University, MBA (finance), C/A CMA (Inter)etc.